Growing up I absolutely loved opening my stocking first thing Christmas morning. Now that I am grown up I don't have that joyful experience anymore. So when I think of all the other grown ups in my family that don't get stockings it makes you want to bring back that joy. 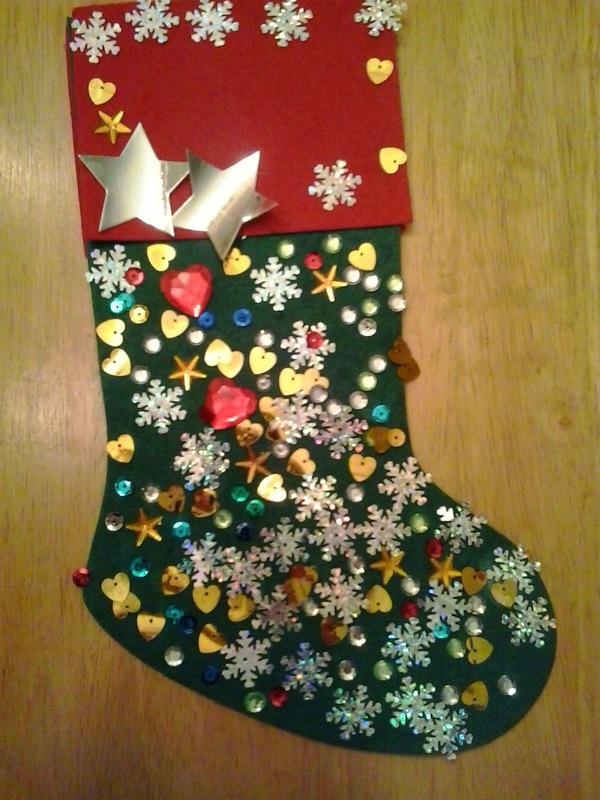 My daughter and I took the time to make some loved ones felt stockings. A very simple gift that you can fill with pretty much anything, and the best part is that you get to give that family member some unique artwork as well. Simply print out the template I have provided above and use it to cut out the pieces of felt. You will need two pieces to create a full stocking and then any embellishments your heart desires. My plan for one of my family members is to fill her new stocking with some treats that she is now forced to enjoy. Becoming gluten free can be a hard adjustment in anyone's life but if you want to see how unbelievably ridiculous the prices are your jaw is going to hit the floor. Go take a gander at the gluten free products in your grocery store it is literally 3 to 5 times the price of regular food. So my lovely granny is going to get some gluten free treats in her stocking and I am going to try out some gluten free recipes for her as well, she needs some holiday baking to. Her birthday is also in December so I found this delicious gluten free chocolate toffee torte from Superstore, it was on sale for under $5 so it was a great score.